Sometimes we’re our own worst enemies. Ryan Lochte managed to prove that single-handedly earlier this week in Rio, when he combined bad boy behavior with tall tales and a very questionable approach of being forth-coming with the media. For nearly three days, the Olympic news cycle was busy tracking a story that didn’t quite add up: Four US Olympic swimmers coming back from a party were robbed at gunpoint. Their demeanors weren’t typical of robbery victims, stories were inconsistent and thanks to the joys of social media, photos didn’t match up with the timeline they were sharing. Cracks in the stories quickly showed and the “Ryan Lochte as victim” story quickly turned into “Ryan Lochte – ugly American”. You could practically hear Ryan Lochte’s future endorsement dollars going down the drain. From a crisis comms perspective, at this point, what you want do is stop the bleeding. While one might never mistake Ryan Lochte for a Rhodes scholar, he (or someone in his camp) made a smart decision by hiring a crisis comms expert to do damage control. Enter Matthew Hiltzik, a NY-based crisis comms expert, who was hired last night to course-correct his client, who was being creatively named in some parts as the “Lochte Mess Monster”. It’s an actual apology – He admits what he did was wrong. He didn’t say “it was regrettable”, he didn’t half apologize by saying “I’m sorry if I offended anyone”. A genuine apology goes a long way in the court of public opinion. 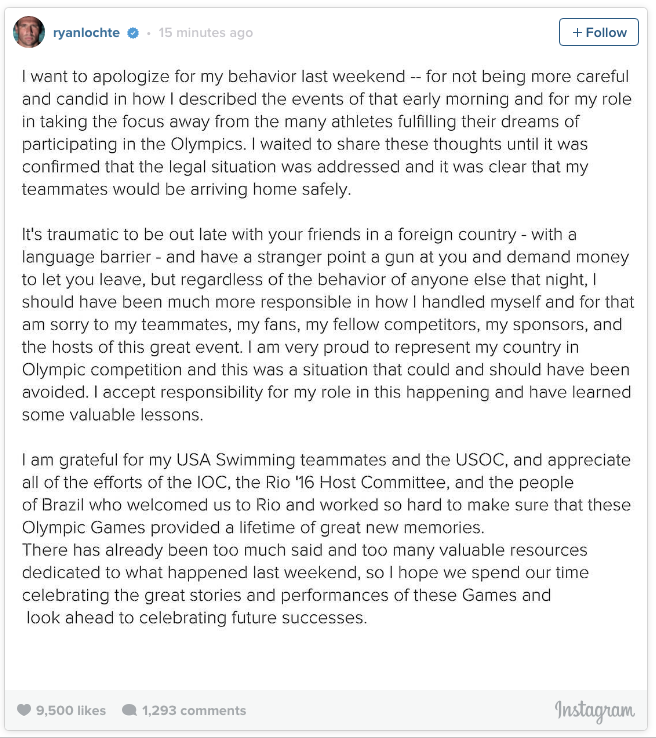 It explains what happened and what Ryan Lochte did wrong – We seen where public figures apologize, but aren’t super-specific on what they’re apologizing for. In most cases, specificity will help keep negative media at bay. It tells (what should be) the definitive side of the story – In Ryan Lochte’s case, he’s told several variations of what happened that particular night in Rio. In this public statement, he tersely tries to tie all versions into more of an airtight narrative that won’t exactly take him off the hook, but it does at least try to explain why he said what he said. The statement isn’t just about him – To move the narrative and the news cycle beyond “Ryan Lochte behaving badly”, it’s important that the spotlight ceases to shine on him. As a diversionary tactic, Ryan Lochte’s statement attempts to do just that. He points out that his behavior took attention away from where it should have been and he explains why. The statement positions Ryan in a way where he says, “I screwed up, I’m sorry, I shouldn’t have taken the focus off my teammates and their amazing feats as well as the incredible job Rio has done putting on the Olympics.” Sure it’s a diversionary tactic, but it’s a diversionary tactic done well. He’s controlling the message – By putting the message on his own social media account, he’s controlling the narrative. The statement is detailed enough that it gives reporters enough to write a story and his fans (and detractors) a definitive statement that leaves little room for follow up questions. He’s now in a position where the Instagram post is his public statement and now he can try to lay low for a while. To mix sports metaphors, if Ryan Lochte is able to stick the landing on the above five points in any and all media interaction he has in the next weeks and months, he might be able to put this behind him.